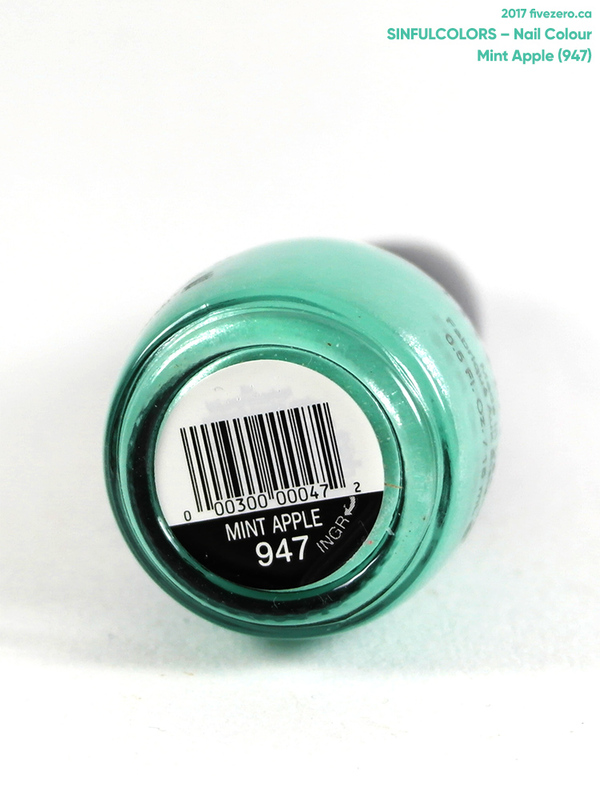 Today’s Throwback Thursday polish is Mint Apple (947), which I first posted about last week. I don’t actually know when it was first released, but it has reviews on MUA going back to 2010, so it’s at least that old. It remains in Sinful’s core collection. It’s a happy-looking light jade green with icy silver shimmer. Super pretty, and only a couple of bucks at the drugstore. What’s not to like? The formula is reasonably easy to apply and fully opaque with two coats. I think this is a unique enough color to pick up, considering how inexpensive it is! SinfulColors Nail Colour, 0.5 fl. oz. / 15 mL. MSRP US$1.99 / CA$2.99. They are made in the USA and are free of formaldehyde, toluene and dibutyl phthalate (DBP). SinfulColors was founded in 1991. The company was acquired by New York, NY, USA-based Revlon in 2011, so they can no longer be considered cruelty-free. Such a pretty color! Perfect for spring! I received this from my friend as part of my birthday present a couple of years back but I think my bottle is a lighter mint shade? It’s really pretty though. I like the subtle silver shimmer. Well, now I want it in a lighter mint shade! The silver shimmer is super cute. What a lovely shade! I only own two sinful colours, but I’ve found them to be quite thin. I don’t know if that’s just because of the colours or if it’s because it’s a cheaper polish. I think it’s a little inconsistent! More hits than misses for me, but yes, it is certainly a cheaper polish so I guess that happens. Which shades do you have? I have ‘Tokyo pearl’, which is a sort of translucent polish anyway. I sometimes use it to create a jelly mani or as a shimmer top coat. And ‘Exotic Green’, it’s pretty bad.